A natural pet supplement with Sutherlandia. 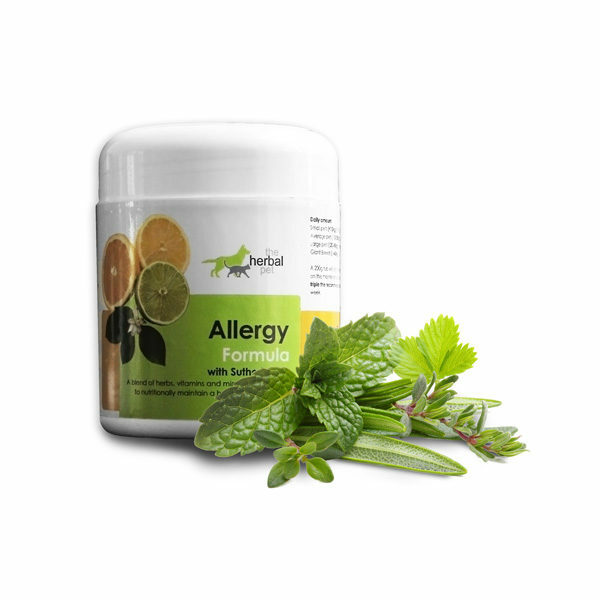 A blend of herbs, vitamins and minerals formulated to nutritionally maintain a healthy skin and coat. My dogsittter started giving my dog this formula while she was staying with them. She was suffering from green slimy discharge in her eyes every morning. When wiped away, it would produce more. After just a few days of being on this, I noticed a huge decrease in the amount of gunk in her eyes. I am now going to buy and start giving this to her to continue the improvement. She also suffers from dry skin on her lower back…I’d like to see if this helps that as well! So interesting, thanks for letting us know! I have two Great Danes who have pretty sensitive tummies and I have found that if their tums get upset they need a couple of feeds with allergy formula sprinkled on it and their tums settle down. Love it because its all natural.